It’s your last opportunity to pre-order a subscription copy of a new book about Bradford City’s extraordinary modern times – as told through the eyes of the people who witnessed and made history. Reinventing Bradford City, by Jason McKeown, features interviews with nearly 30 people connected with the club – players, managers, directors, journalists and fans. It tells the story of how Bradford City recovered from the traumatic events of the Valley Parade fire, and the rises and falls through the football ladder since. The climb to the Premier League, the incredible run to the League Cup Final, the nearly season, the barmy night in Blackpool, and last season’s FA Cup victory over Chelsea. These are just of the same astonishing stories re-examined and re-told. Stuart McCall on the aftermath of the fire and the push for the top flight. Mark Ellis on what it was like to play at Odsal stadium, as Valley Parade was rebuilt. Terry Dolan on the Nearly Season, the transfer fall outs and the pain of the play off defeat. Lee Duxbury on what it was like to play for John Docherty, and how Chris Kamara got the club promoted through the play offs. 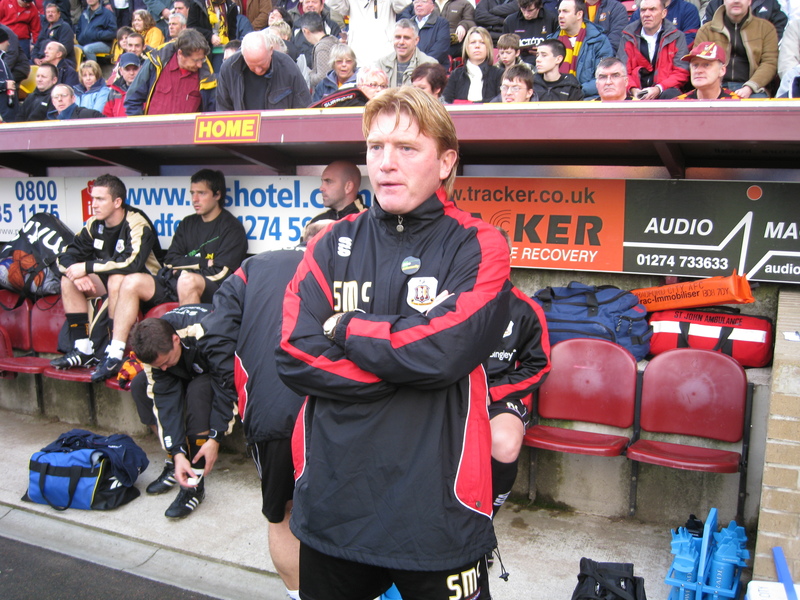 Stuart McCall on his return to Valley Parade and the fairytale rise to the Premier League. Jamie Lawrence on the Premier League adventure and where it all started to go wrong. Julian Rhodes on the nightmare of administration twice, and rebuilding the club. Mark Bower on fighting to reverse City’s decline down the leagues. Stuart McCall on managing Bradford City, and dealing with the pressure he placed on himself to succeed. Michael Flynn on playing for Peter Taylor and Peter Jackson. James Hanson on becoming a professional footballer and scoring the goal that took his hometown club to a major Wembley final. Phil Parkinson on changing the culture of a football club, how to produce a giant killing, and the memorable end to the History Makers season. Andrew Davies on turning around a struggling League Two club and being part of some of City’s greatest-ever moments. David Baldwin on growing the club on and off the field. Phil Parkinson on beating Chelsea and another thrilling cup run. James Mason on driving fan engagement during the 2015 FA Cup adventure, and what it was like to watch the Chelsea victory from inside the Stamford Bridge directors box. There are also interviews with journalists Simon Parker and David Markham, a look at how Geoffrey Richmond joined Bradford City in 1994, and supporter opinions from the Bantams Banter duo, Mike Harrison, John Dewhirst and Michael Wood. Reinventing Bradford City includes a foreword by BBC Radio 5Live chief football reporter and Match of the Day commentator, Ian Dennis. Supporters have one last opportunity to subscribe to the book and have their name printed in a special subscriber’s section for posterity. Given the costs of production a restricted number of books will be printed – so if you want to guarantee a copy of the book, you have until February 29 to take up the subscriber offer. The subscriber copy is £20 which includes postage and packaging (or £25 for a hardback version). I wondered if you could contact me via e-mail(you have my address), I have a question about these products, thanks in advance. I have emailed you tonight, thanks.